INDIA, Jan. 31, 2019 /Christian Newswire/ -- Persecution Relief is an interdenominational initiative registered as a non-profit organization in the USA with 501(c)(3) certification that provides comprehensive support (prayerful, financial, political, judicial) to the persecuted Christians in India. Christians in India have not faced this level of persecution since India gained it's independence 70 years ago. Since 2016 Persecution Relief has registered & supported more than 1200 persecution cases including more than 8 men & women who have been martyred for the sake of the gospel. Persecution Relief has the privilege to adopt all the families of the pastors who were martyred. 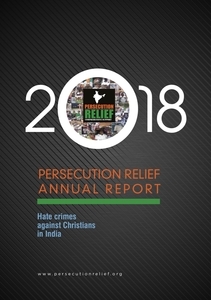 Persecution Relief's 2018 Annual Report - Hate Crimes Against Christians in India can be viewed here. Christians worldwide and the public in general are encouraged to circulate this report to friends and family and to pray and support the persecuted church in India. Persecution Relief's mission is to provide comprehensive support to the persecuted church in India by linking it to the free church of the world.